Day 11- and I tried something new. Well, new to me. I just took a page in my journal and started adding colors. I knew I wanted a bouquet in a pot of some sort and the pot turned out to be a teapot of sorts! lol I walked off and let it dry! That is so hard for me to do - once I start I just want to keep on going, but I knew I couldn't add ink until it was dry so I busied myself . 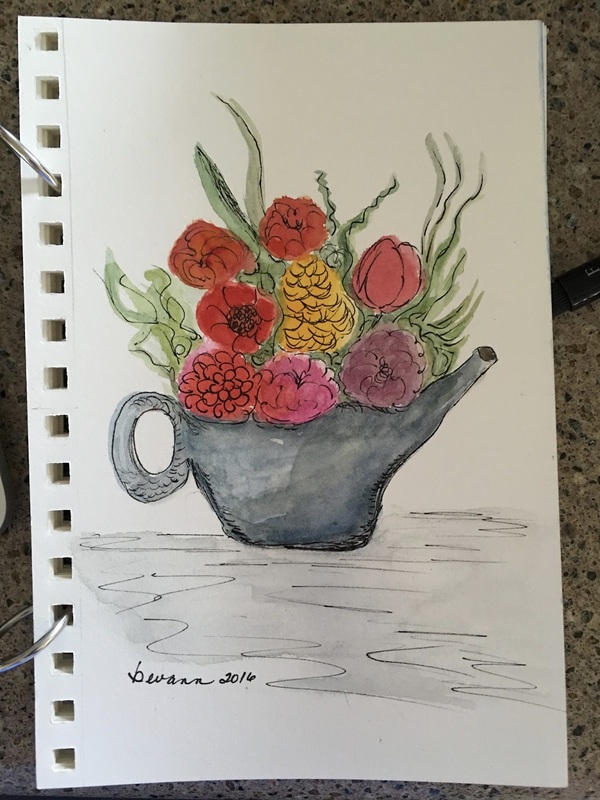 When I came back I began to do some inking with my Pitt fine point pen and added some additional green stems and leaves and added some color to the flowers and teapot. I added some swirls and color to ground it. I was pretty sure I was done, so I signed and dated it! Well, that was not the case. As always, I had to add some more ink and color and then I could call it done. Well, for today! lol I will probably still add more later, even weeks or months later when I look at it again and see a spot that I would like to change. I'm not for sure a piece is ever done! There will be another sketch tomorrow, but may save up for a few days and do a post about my most current yarns. Come back and see what's next. You can always find me on Instagram and Facebook, too!